Employee training is a critical component of a productive organization. As technological advances are creating new types of jobs, the pressure is on companies to develop integrated talent management strategies that improve employee productivity. At the same time, talent and skill shortages are forcing many businesses to retrain existing employees. This requires access to an employee training management system that is easy to deploy, access, and create learning content. The 2019 Mercer Global Talent Trends study indicates that nearly half (48 percent) of the 7,300 respondents, including C-suite executives, HR leaders, and employees across 16 geographies and nine major industries polled are, “Adapting skill requirements to new technologies and business objectives.” This learning data also shows that two out of three companies are coming up with new ways to reward and compensate employees based on performance. In a perfect world, every employee would be at 100 percent productivity. But we know that isn’t the case, as unexpected factors can get in the way of a productive team of workers. Here are some of the top reasons productivity may drop in your organization. A Towers Watson survey correlates the destructive nature of stress with its impact on employee productivity. Their research revealed that 57 percent of employees reported being stressed and disengaged from their jobs. Being that every aspect of work is run by some form of technology, some employees are feeling overwhelmed. Sixty-eight percent of full-time American employees are dealing with work overload, based on a study from Cornerstone OnDemand. More than half of these employees complain that the time they need to complete assigned tasks has outnumbered their work hours and it’s just getting worse. Workers rely on managers to guide them and assign reasonable work tasks. However, not all people should be in management positions. A manager who lacks intelligence to do the job well can cause worker productivity to drop. If an employee doesn’t have resources for learning new skills as part of a laid-out career path, it will become difficult for him to maintain high levels of productivity. A career path helps to motivate employees and includes training support. The Cornerstone OnDemand survey (mentioned above) also indicated that 65 percent of employees believe that a flexible work schedule will improve employee productivity. Taking meetings virtually, allowing employees to work remotely, and automating some tasks could take pressure off employees. Why is employee productivity important to an organization? There are several reasons why employee productivity is essential to the overall organization. Bronwyn Timmons who contributes to The Nest, says, “Productivity can literally make or break a company, and an office staffed by sub-par employees has the potential to fail.” Three areas where productivity impacts the organization the most include the general business (financial) performance, teams, and individuals. If productivity is high, revenues and sales are high. If productivity is good in a team, they are working well together and completing projects on time. If individuals are productive, they are happy and contributing to new ideas. How does training connect with employee productivity? Training has a strong connection with employee productivity. With the talent war still raging, companies can put their focus on internal training efforts. This is more cost-effective than hiring from outside the organization. Training also increases skills and innovation in the organization, which promotes productivity, and growth. When employees feel supported and they are getting the right amount of training, this is a real boost to employee morale. Happy employees are productive. They are also less likely to leave the organization. Training gives employees a chance to learn new things, which creates new career opportunities. If your organization needs to increase employee productivity in certain areas, there are some steps you can take. Survey employees to discover learning needs – Ask your employees in a company-wide survey. Find out what areas employees need training support in, and provide this training on-demand. Review performance goals and address learning gaps – Every employee should know what his performance goals are, and have a plan of action to fill in any learning needs. Develop structured training that’s easy to access by all employees – More than half of all US workplaces allow for remote work. Inclusion is a necessity. Make sure training is accessible and easy to use by all employees. Make ongoing training a regular part of all employee experiences – From day one of onboarding and throughout the life cycle of an employee, make learning a priority to maintain productivity. Promote and recognize learner achievements – Employees respond well to regular feedback and praise concerning training. This helps them to feel appreciated and motivated. Develop training for management career development – All employees should have a career track that leads them into management roles. Set up professional leadership training and teach the skills your managers need to be effective. Measure productivity before and after training (impact) – The only surefire way to understand how training impacts your productivity is to measure it. Understand how productivity increases after training by reviewing training reports. An employee training management system that will have a positive impact on the productivity and engagement levels of your employees should have the following features. Look for these when evaluating any corporate learning platform. Multiple formats for course content – Accepts text, slides, audio, video, etc. 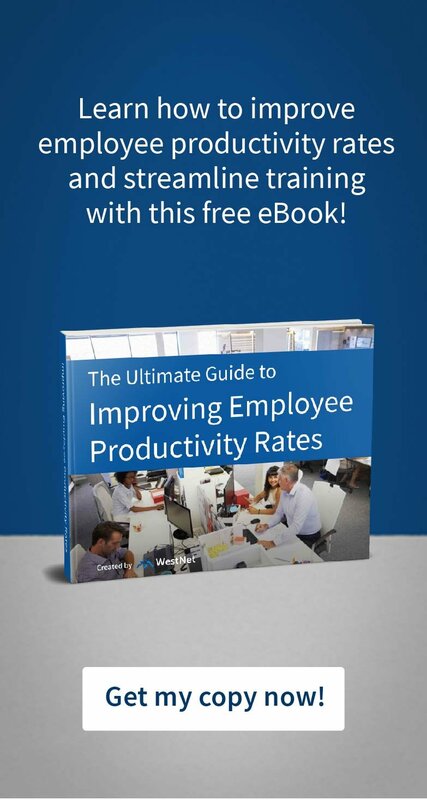 In conclusion, training efforts are well worth the investment because they have a direct and immediate impact on employee productivity management. An employee training system has the ability to make training available to all employees, to increase participation and the opportunity to learn new skills. No matter where your employees are performing currently, learning can motivate and inspire all to increase the quality and output of work. WestNet Learning is an all-in-one LMS solution to easily train employees, increase employee productivity, and address safety needs. Customized eCourses, analytics, reporting, and certification tracking to help manage staff and stay on top of what matters most. To learn more about how you can improve your employee’s productivity rates and implement a dedicated LMS, feel free to reach out to WestNet today for a 1-on-1 walkthrough!